2,174 deaths, 81% of them were civilians: 530 children, 302 women and 64 unidentified people, while 16% were military. 87,010 were wounded including 3,303 children, the third of them with permanent disability, and 2,101 women. 145 Palestinian families lost three family members in one incident, totaling 755 individuals. 100,000 displaced Palestinians have become without a shelter. 2,465 houses were fully destroyed, 1,466 houses were partly destroyed, 3,950 houses were damaged in addition to five residential high buildings that were fully destroyed. 9 water treatment plants were targeted, as well as 18 electrical installations, 19 financial and banking institutions, 372 industrial and trade institutions, 55 fishing boats, 10 hospitals, 19 health centers, 36 ambulances, 222 schools (141 public schools, 76 UNRWA schools and 5 private schools), 6 universities, 48 associations, and one power plant. The Palestinian efforts successfully led to the UN recognition of the Palestinian State and the adherence of the State of Palestine to the international organizations. The Palestine Liberation Organization and the Palestinian Authoritycontinue their efforts towards the resumption of the peace process, but this could not lead to the constitution of an international pressure group that would force the Israeli Government to resume the peace process with the Israeli obstinacy and the perseverance of building settlements, dividing the cities of West Bank, and the continuing of Judaization of Jerusalem. In addition to the repeated aggressions by the settlers against the civilian population in the West Bank villages and cities and the continued the siege on Gaza and the delayed reconstruction process due to obstacles imposed by the Israeli policy on the crossing points. 1. The Gaza Strip was the subject of the Beach Agreement (April 2014) signed by Fatah and Hamas. As a direct result of this agreement, the national unity government was constituted but this government was only formal and made no effective achievements that would reestablish the legal and service link of its institutions between the West Bank and Gaza Strip. It also failed to start the reconstruction of Gaza after the last war and brought no solution to the issue of displaced persons staying in shelters and temporary residences. The political divergence between Hamas and Fatah prevented the national unity government from putting in force its mutually agreed competence. 2. The political leadership represented by the Presidency is concerned with the principle of division of power and the attempts to monopolize all the legal frameworks of the PLO and the Palestinian National Authority (PNA) in favor of a specific party without national consent given by all the Palestinian components. With the failure of the Palestinian leadership and all the political components in offering any clear and convincing political visions for the local population in the Gaza Strip, the West Bank, Jerusalem and the Palestinian Diaspora, all this caused huge disappointment to the Palestinians especially with all the obstacles that are being faced by the Palestinian people who lives inside the Palestinian Territories or in the exile. 3. The Palestinian Territories have been witnessing a general decline in the public freedoms due to the impact the political differences have on the civil society organizations and personal freedoms and the security control. In West Bank, the Palestinian Authority security agencies increasing the use of Law as a tool for settling political differences along with the ongoing arrests on the basis of political reasons. In Gaza Strip, Hamas security agencies also continue monopolizes the control over Gaza Strip, violates the public freedoms, imposes constraints on the local population and operates arrests on the basis of political affiliation. It also refuses to offer any concessions that would allow the national unity government to exercise its prerogatives especially the control of the Gaza crossing points in order to start the reconstruction process. The socioeconomic situation in the Palestinian Territories is witnessing a serious decline due to the increase of the number of young unemployed graduates, with a high cost of living and an income level not matching the prices. According to the 2014 local and international reports, the poverty rate in the Palestinian Territories reached 40% and the unemployment rate amongst the youth 43.7% although 50.5% of them are university graduates. 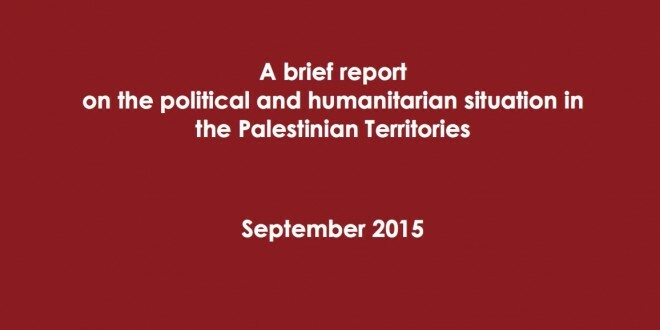 Many shocking reports on the humanitarian situation in Gaza Strip were recently issued by the international agencies. The UNRWA latest report mentioned that 52% of the Palestinian people in the Gaza Strip live below the poverty line, whereas the unemployment rates reached 45% at the beginning of the current year. All this with complete absence of any clear development plans aiming at facing the challenges with the continuation of political and legal separation between Gaza Strip and the west Bank. In addition, the human segregation caused by the Israeli government practices in the West Bank and the tightening of the blockade on Gaza, which is likely to aggravate the humanitarian situation of the local population in the Palestinian Territories. Intensifying the pressure exerted by the PLO, the Arab governments, the League of Arab States and the International Community on the Israeli government for the resumption of the peace process, the establishment of a Palestinian State with Jerusalem as its capital city and according to the June sixth 1967 borders, in compliance with UNSC Resolutions 242 and 338 and the settlement of the refugees’ issue according to the UN General Assembly resolution 194. Calling on the Palestinian President and all the Palestinian components to reach a Palestinian consensus on the issues of disagreement, to work on a reform of PLO as a unifying framework and a reactivation of its institutions, to agree on a representative mechanism for the Palestinian National Council that covers all the Palestinian components, to adopt the principle of elections as the only means for Palestinian representation, to put an end to the situation of division caused by political differences at the decision-making levels in the PLO and the PNA institutions. Proceeding immediately to legislative and presidential elections in order to renew the Palestinian legal institutions and put an end to the state of Palestinian division. Proceeding immediately to the reconstruction of Gaza Strip and the lifting of the blockade and working on the adoption a national plan in order to face poverty in the Palestinian society. Following up the situation of the refugees and displaced persons in the Palestinian camps in Syria and especially Yarmuk in order to provide them with shelter, food and housing. ForMENA will continue following up the situation in the Palestinian territories and the situation of the refugees abroad as a primary issue on the agenda of ForMENA. It is also about the right of the Palestinians in the Palestinian Territories and in the exile to enjoy freedom and independence after the long-sufferings they have been enduring since 1948. An international organisation, which is dedicated to upholding fundamental values of democratic governance, individual freedom and human development.